With marathoning and half-marathoning season in full swing, congrats to all that ran a marathon or half last week and a good luck to those running one this weekend! For the rest of you, its the last official run of marathon training season. It is the week to reflect back on a very hot day in July when we ran a hilly route and you wondered how you would ever make it through all these tough miles. I told you it would get easier and it would get cooler. Now its mid-October, it is in fact cold out by my calculations and this week should prove it got easier. 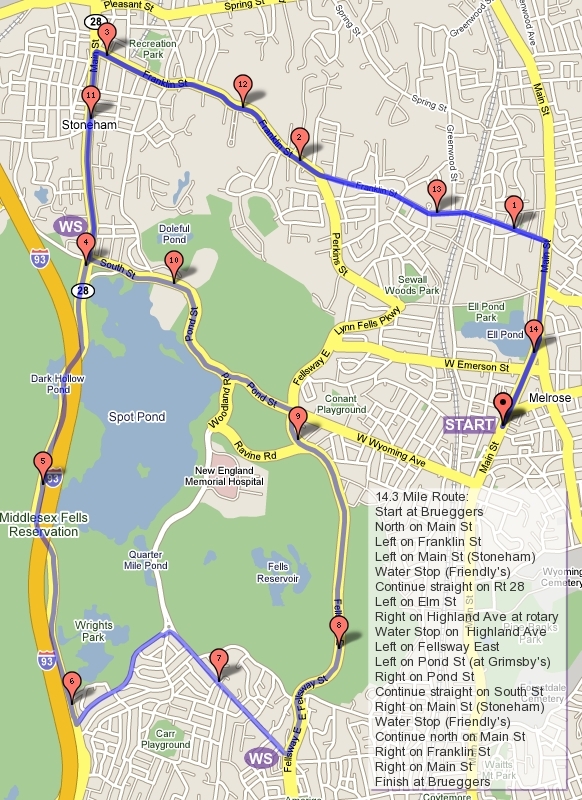 We’ll be running the same roads we covered in week 2 (although in a slightly different order since no two runs during your training were exactly the same) and I guarantee it will seem simple, especially if you’re training for Baystate. The route starts up Main St towards Ell Pond, give the Clarence DeMar marker a tap for one last good luck, and continue up to Melrose St where you go left. Another quick left and you’re on the Lynn Fells Parkway. Past the high school, through the hills, past Grimsby’s and through some more hills, run until you reach the rotary at Highland Ave. A right onto Highland will bring you up to water stop 1. From water stop 1 go straight past the hockey rink along Woodland Ave on the Melrose side of Spot Pond (the front side). Yes, this is the week we go all the way around the pond in the opposite direction than we typically go. Keep going around the pond and after you crest the hill on Elm St take a right at the little rotary back to the water stop. From there you take the left on East Border, climb the swear-at-jim hill and note that you’re less inclined to swear at me because you’re a better runner than you were when we started this 14 weeks ago. At the set of lights turn left, a quick little jaunt through the last real hills of the Fall 2012 season will bring you back to Grimsby’s, a right onto Wyoming takes you back to Melrose, and a left on Main St will bring you back to Brueggers! The shorter route (unfortunately those are tougher to make different every week) will be one you’ve run before. Run with the long runners until you get to Pond St, turn right there and come back Wyoming to Main for about 7 miles. Water Stops: this week I believe I’ve got them covered, but I do enjoy company so stop on by if you like. Brunch: Not this week, but we’ll be having the SLR post training season brunch in a few weeks. I need a volunteer to host, and then its up to each of you to bring your goodies and your race stories and we’ll celebrate another season of training. So who’s in for the run? ROLL CALL!!!! With Baystate two weeks away, Newport next week, and Mohawk-Hudson this weekend (GOOD LUCK!!! ), marathon season is in full gear! This week, with the 22 miler in the rear view mirror, we have a simple taper run in front of us. The route follows the Swains Pond start up to Melrose Common, right on Swains Pond Road, through the quiet rural part of Melrose, right onto Lebanon, and left onto Forest St to the first water stop at Citizens Bank. After that its time to run to the High School. Head out Winter St past Oak Grove, cross at the light straight onto Glenwood St. Follow the twists and turns all the way to the rotary at the FellsWay East. Turn right there and meander over the hills and through the woods to the LynnFells Parkway. Keep going until you get to the Knoll in front of the Melrose High School for water stop number 2. When you’re done there keep taking the Lynn Fells up to the Main St in Saugus intersection, you know, where J Pace’s used to be. Turn left there and run Farm St up to Nahant where you go left and come out by Nick’s Pizza. There will be your last water stop of the day. From there you know the way home, Main St south until you hit Brueggers! Seems a lot shorter than last week, doesn’t it. As far as water stops go, I think I have it covered myself but I’m always open to help showing up. Just so we know who’s coming… ROLL CALL! See you at Brueggers, 8AM!